For me, the hardest part of living in a new place is not knowing anyone. As much as I enjoy being home -- ignorant of what I look like and doing whatever I want -- I like knowing that I have friends nearby to meet for dinner or a drink or a movie. For many adults, co-workers become close friends. Work is where I met some of my best friends! While I like the people I work with, the stars haven't aligned for friendships outside of work, and that's okay. Those great relationships usually show up when they're least expected anyway. It could be a neighbor or a new co-worker or someone at a yoga studio. Only time will tell. Despite the many people in this city I have yet to meet, I did see a familiar face the weekend before last! Okay, if I'm being honest, the term "familiar" is a bit loose, considering I had only seen her on her blog and in social media. Yup. Blog-life-turned-real-life friendship strikes again! I never would have thought that blogging to share things with my family and friends afar would lead me to new friends. Does anyone else think it's crazy that I can move to nearly any part of the country (and even other countries) and probably find a blog friend close by? It's kind of incredible. When we moved to Knoxville, Britt told me she'd be in town for a wedding a few months later. 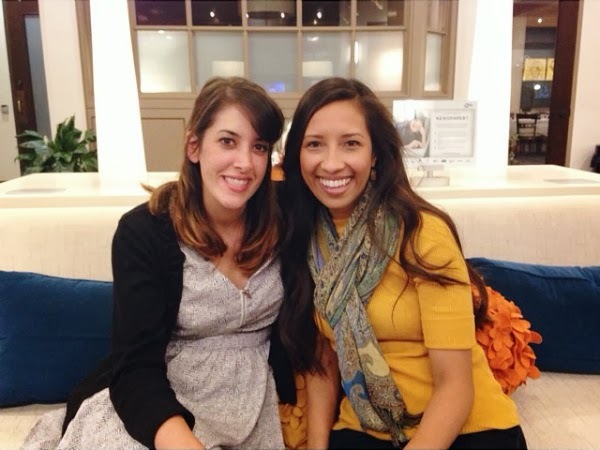 I "met" Britt last summer when she co-hosted a link-up called "From Blog Life to Real Life." A year and a half later, that title sums up our friendship perfectly. Oh, the foreshadowing. I was sitting in the hotel lobby looking at the latest photos of my nephew on my phone when she walked up. We agreed that it was weird to think that it was our first in-person meeting, because we were already friends. We hugged, took up residence in some comfy chairs, and gabbed about the wedding, Scarlett, living in the South, family, marriage, and of course, blogging. We had a really interesting conversation about how we think we're perceived through our blogs vs. who we really are. (An entertaining link-up in the making, perhaps?) I think we were mostly who the other thought we'd be. Mostly. ;) We are more alike than I had expected! This blogging thing. It's been an unexpected joy in my life for this exact reason. The people. And I'm lucky that I seem to always find the right people. Good people. Britt, thanks for letting me crash your family time in Knoxville! You're the best! Well I have to say that I'm pretty envious of this meet up, but I'm SO glad that you had a familiar face turn IRL friend. You two seriously are so beautiful!!!! Aweee love you Lindsay! And I miss you tons! What a sweet post about our night, you captured everything so perfectly! My family loved you and still talks about 'britt's sweet/pretty blog friend' haha. How fun! I was jealous of your guys meet up when I saw you post it on Instagram! You girls are my favorite!